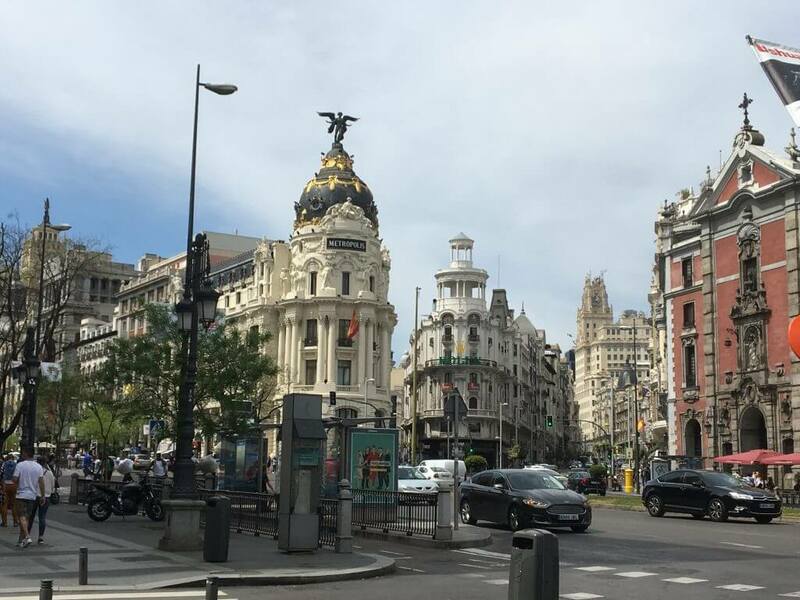 Madrid has plenty of great neighborhoods to stay in, and honestly, it’s difficult to pick a bad one if you’re staying anywhere near the center. While each of Madrid’s neighborhoods is unique, they all have something different to offer and are well-connected to each other. Our recommendations when visiting Madrid, are that you stay in Malasaña, Lavapiés, Las Letras-Huertas, La Latina, or Sol-Gran Vía. These are all different neighborhoods that are close to the center of Madrid and close to everything you’d want to see in the Spanish capital. Of course, there are other neat neighborhoods that you could stay in and still have an amazing trip to Madrid. 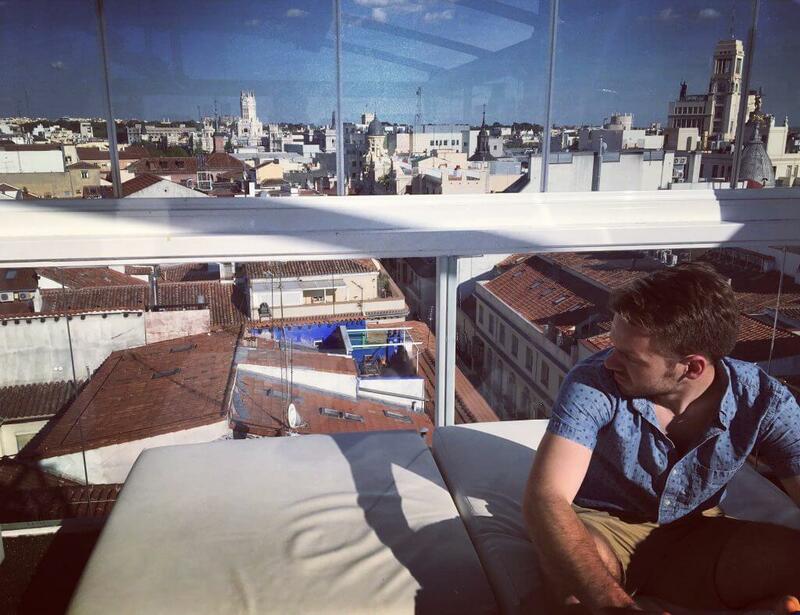 In Madrid, we recommend staying in an Airbnb or a hostel. The Airbnbs in Madrid are very reasonably priced, especially in comparison to those in the US. 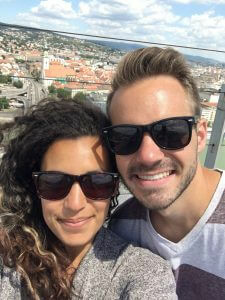 We find Airbnbs to the best if we’re traveling as a couple or with a group. However, hostels are great if you’re traveling solo. 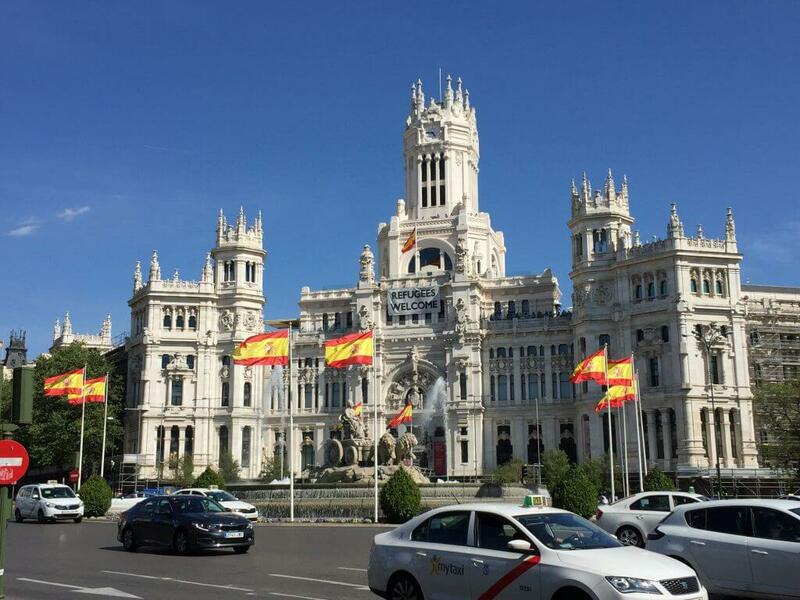 As with most major capital cities in the world, there’s a ton to do, and Madrid is no exception to that rule. 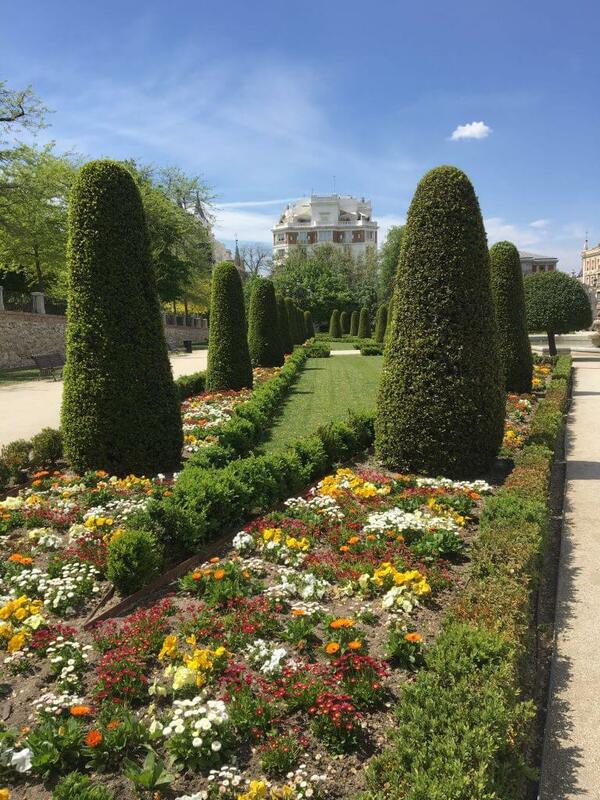 Parque del Retiro (Retiro Park) – While visiting a park is always a good option for budget travelers, we recommend a visit to Parque del Retiro for anyone visiting Madrid. 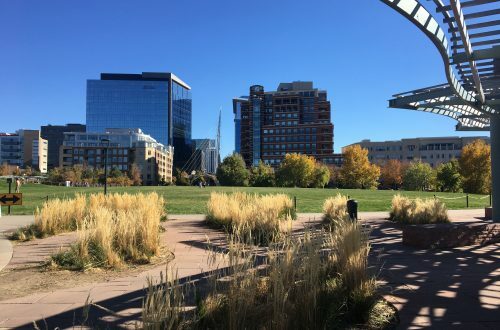 It’s about half the size of Central Park in New York City but offers the same peaceful escape. Go for a run, have a picnic, or just find a nice sunny spot and take a siesta in Parque del Retiro. 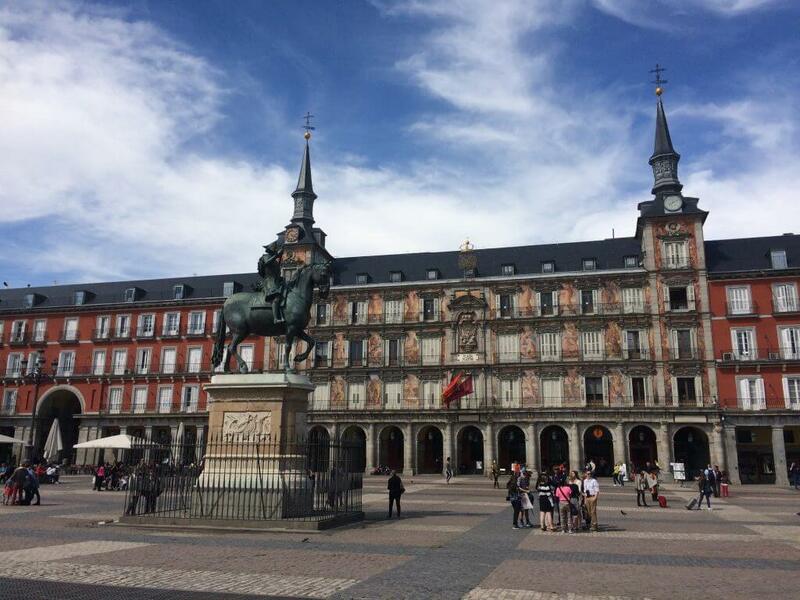 Plaza Mayor – Plaza Mayor is the main square in Madrid, and all of Spain for that matter. 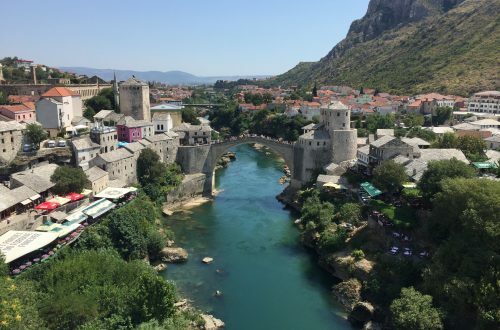 It’s usually super packed with tourists but is worth a visit. Museo Nacional del Prado (Prado Museum) – The Prado is one of the best art museums in the world, and certainly in Spain. Be warned that the line to get in might be long, but the Prado is worth the wait. There is good news though! You can buy tickets for the Prado in advance on their website. If you forget to buy your tickets ahead of time, make sure to get there early so you don’t have to waste your time in line. Museo Reina Sofia (Reina Sofia Museum) – Generally regarded as the second most famous art museum in Madrid, the Reina Sofia is actually Mike’s favorite. The Reina Sofia’s most famous piece of art is Picasso’s Guernica. An important thing to remember about this museum is that it’s closed on Tuesdays. 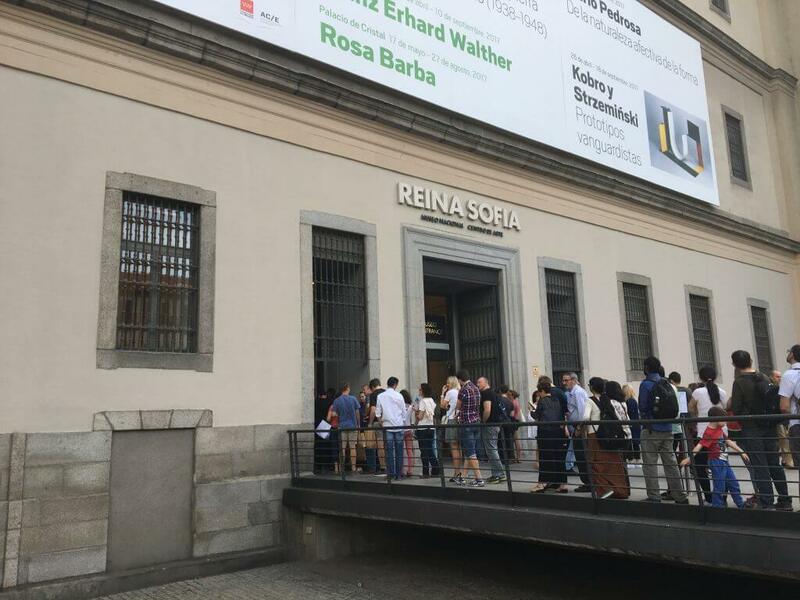 If you’re a budget traveler but still want to visit, the Reina Sofia is free on Monday-Saturday (except Tuesday of course) from 7-9 p.m. or Sunday from 1:30-7 p.m. If you’re not there early be ready to wait in line, but hey, the wait’s worth it to see world-class art for free in our opinion. Check out Madrid from Above – One of our favorite things in any city is getting a view from above. It’s one of the few things we’ll shell out money for, even when we’re trying to keep a budget. You really can’t beat a spectacular view, and there are a lot of places with amazing views in Madrid. 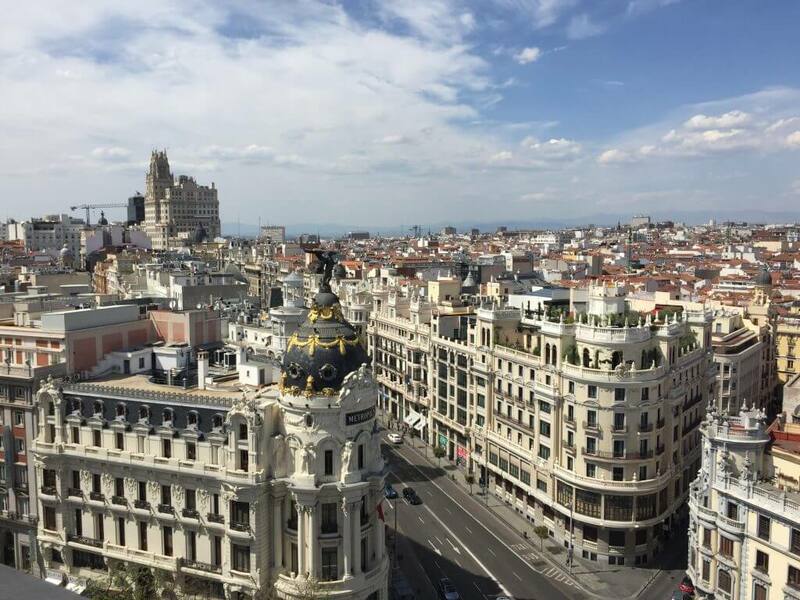 Our favorite places to get a great view in Madrid are El Corte Inglés, La Terraza de Óscar, and La Terraza del Urban, and, for the best view in Madrid go to Círculo de las Bellas Artes. Kilometer Zero in Puerta del Sol – Whether you want to visit or not, you’ll probably end up in Puerta del Sol as it’s right at the center of Madrid, and the country for that matter. 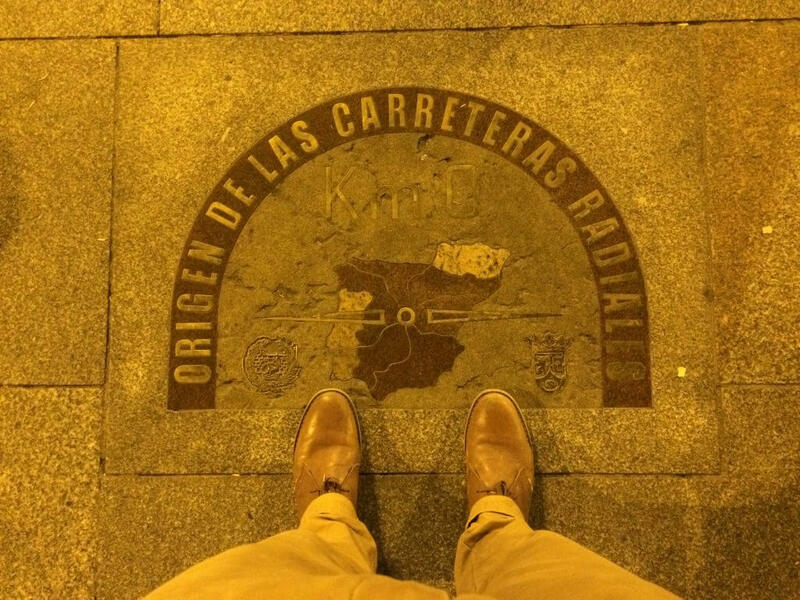 We say country because in Puerta del Sol there’s one specific spot called Kilometer Zero (Kilómetro Zero) which is the geographical center of Spain. Puerta del Sol will most likely be a metro stop or a place you pass through. As you move about the street performers and club promoters, try to find Kilometer Zero as it’s a sort of cool sight in Madrid. Plaza de Ciebles – The Plaza de Ciebles is one of the most famous areas in Madrid. There’s a fountain in the middle of the plaza, which is more of a giant roundabout, and the buildings around it are the Madrid City Hall and the Banco de España. It’s a pretty photographic place that’s right on the way to the Prado Museum or Retiro Park from the center of Madrid. Palacio Real (Royal Palace) – The Royal Palace of Madrid is elaborate, detailed, and incredibly beautiful if you like seeing how royalty lives. Admission is 10€, and you can buy the tickets in advance here. If you’re not really feeling going inside, make sure to stop by the exterior just to see it. It’s not out of the way as it’s located between the Plaza Mayor and the Temple of Debod. Templo de Debod (Temple of Debod) – The Temple of Debod is an ancient Egyptian temple that was built is 200 BC in Egypt. It was donated to Spain in 1968. The sight of an ancient Egyptian temple in the middle of Madrid is very unique and kind of strange. 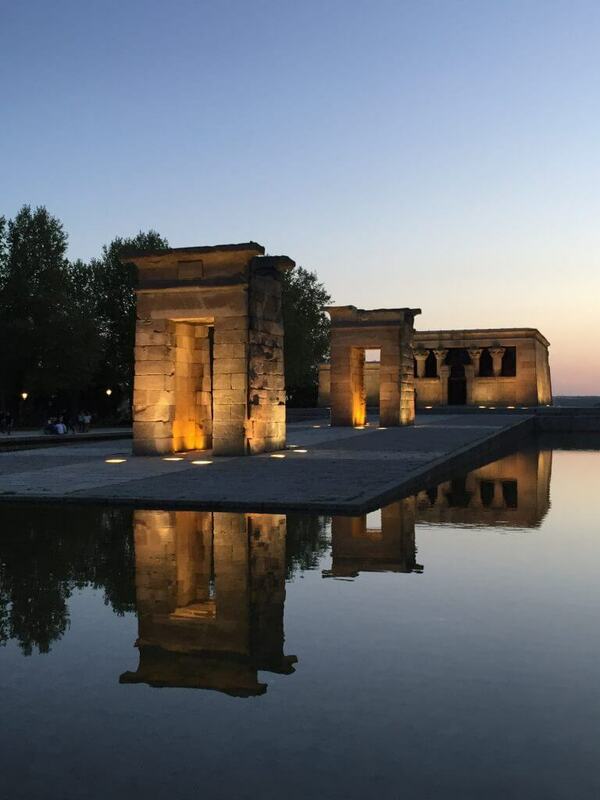 The Temple of Debod is a great place to see the sunset in Madrid though! El Tigre – El Tigre is a somewhat famous cheap place in Madrid for food. They give free tapas with every drink you order. The tapas aren’t small either! While the food isn’t the absolute best food you’ll find in Madrid, it’s great for the budget traveler who is looking for good Spanish food at an affordable price. Casa de Valencia – Casa de Valencia is a nice restaurant with delicious food in Madrid. 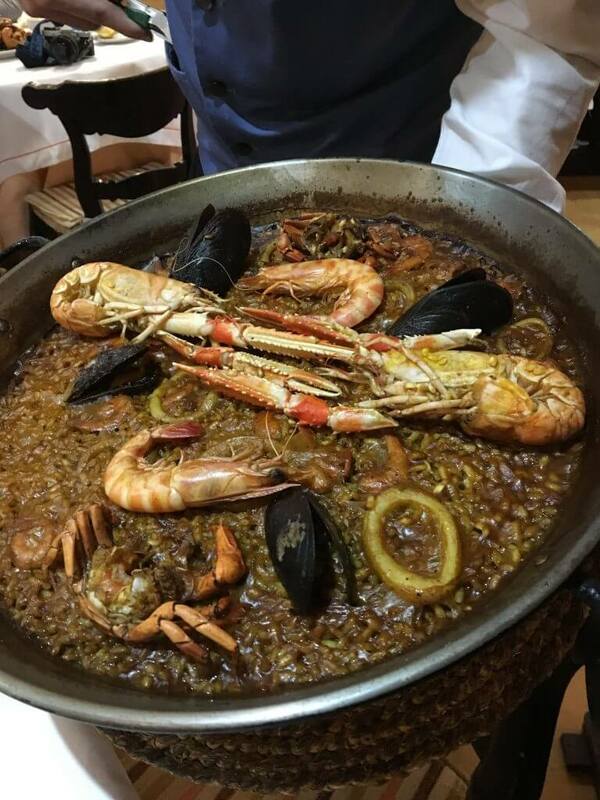 It’s located near the Temple of Debod and serves up the best paella we’ve ever eaten! The restaurant is on the fancier side and is a little more expensive, but it’s so delicious. Mercado de San Miguel – The Mercado de San Miguel is right near the Plaza Mayor, in the center of Madrid. They have a big variety of food you can get inside. It’s worth at least walking through, even if you don’t buy anything. As it’s right in the center, it’s a little expensive, but still worth checking out. We had a few tapas here, and they were really good. 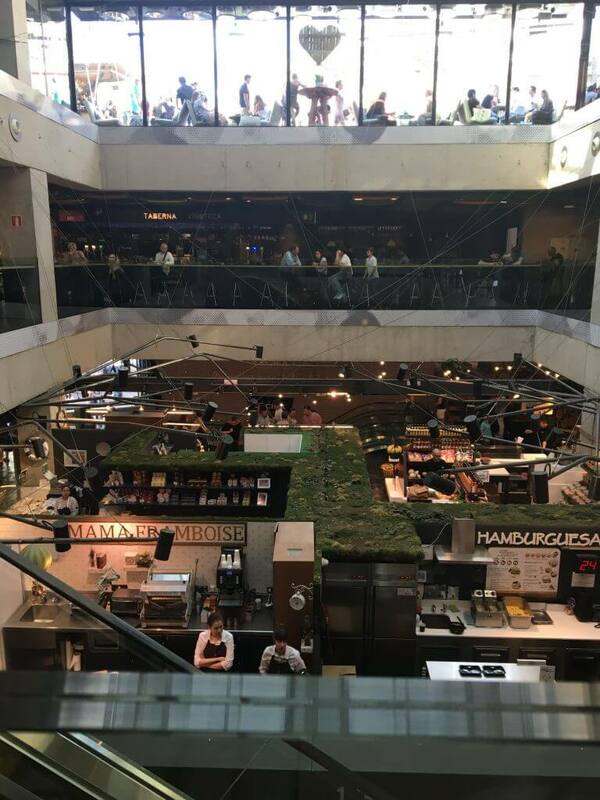 Mercado San Antón – The Mercado de San Antón is right in the heart of the Chueca neighborhood and is a cool market with lots of fresh food and eating options. There’s even a bar here that has a cool outdoor rooftop patio. 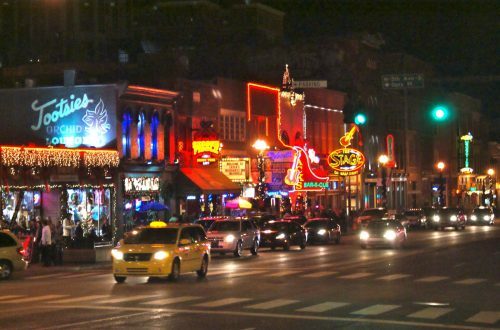 If you’re in the area, we recommend stopping here for a bite to eat or a drink. 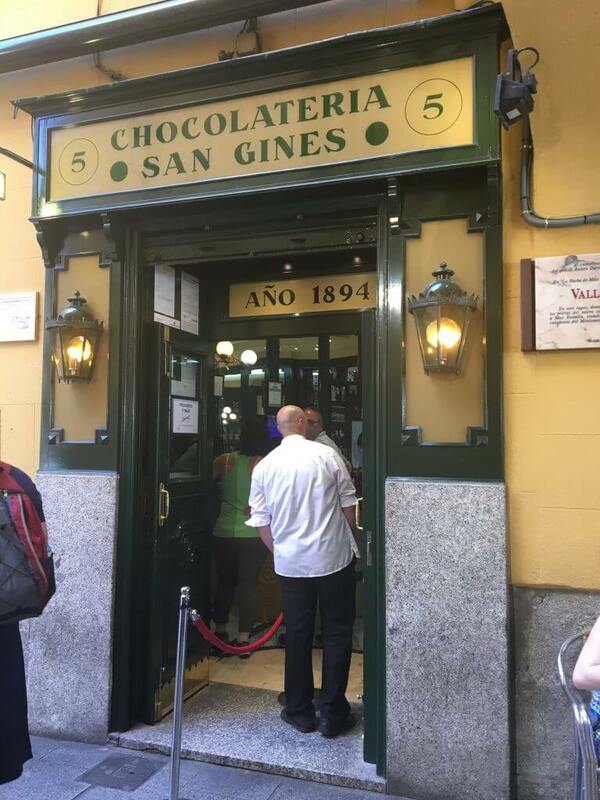 Chocolatería San Ginés – We recommended a few places to eat lunch, dinner, or snacks, but you’re probably saying WHAT ABOUT DESSERT?! Well, you’re in luck. Chocolatería San Ginés has delicious churros con chocolate right in the center of Madrid. If you go during a busier time, you might have to wait a bit as seating is limited, but the churros are worth the wait. Los Artesanos 1902 Chocolatería – Whether you’re craving more churros con chocolate or the line for San Ginés is just a little too long for your liking, check out Los Artesanos 1902 Chocolatería just a few blocks away. 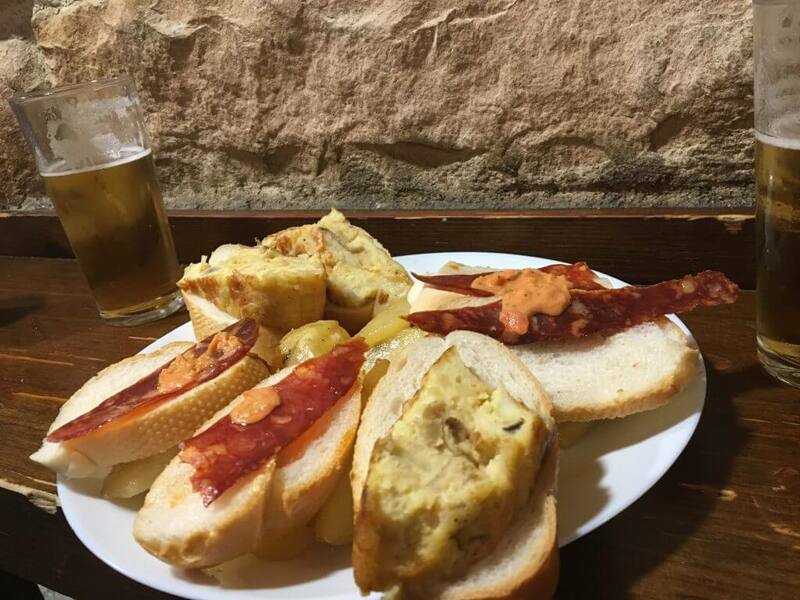 In our opinion, it’s just as good, if not better than San Ginés, and the line will probably be shorter because it’s not as famous. 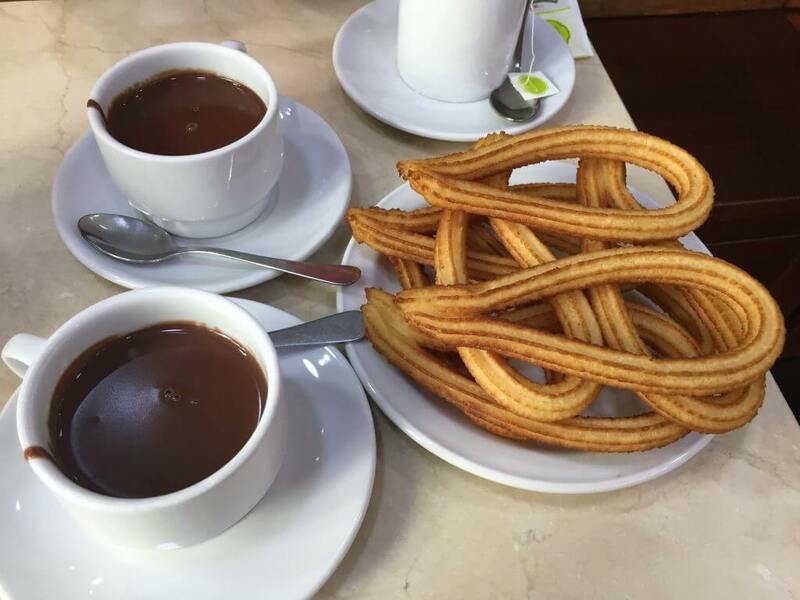 As we said, we prefer the churros at Los Artesanos 1902 Chocolatería, but try them both and decide for yourself! Sobrino de Botín – First off, we need to admit that we have not been here. 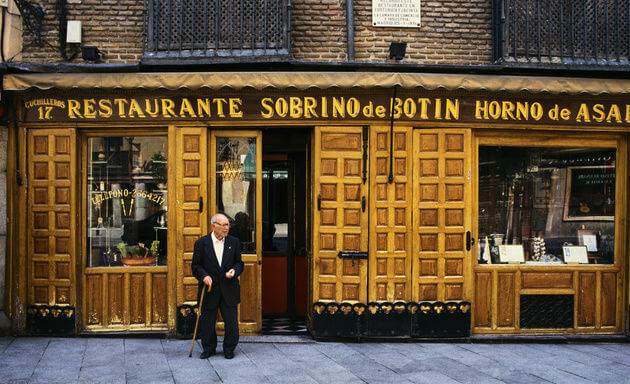 However, Sobrino de Botín is the oldest restaurant in the world (allegedly). It was first opened in 1725 and has been open ever since. In fact, the flame in the oven has supposedly never been extinguished and continues to burn. Hemingway talked about one of the famous dishes cuchinillo asado (roasted suckling pig) in The Sun Also Rises. Now that we’ve listed all the places to eat, let’s check out our recommendations for where to drink in Madrid. After all, Madrid is said to have the most bars per capita of any city in Europe! Círculo de las Bellas Artes – The Círculo de las Bellas Artes is the best rooftop bar in Madrid. Yes, you have to pay 4€ to go up, but the views of Madrid and the vibe make it well worth it. The view is incredible from all sides and makes for great photos. When we were there, a DJ was playing some nice music to go along with the relaxing mid-afternoon drink. 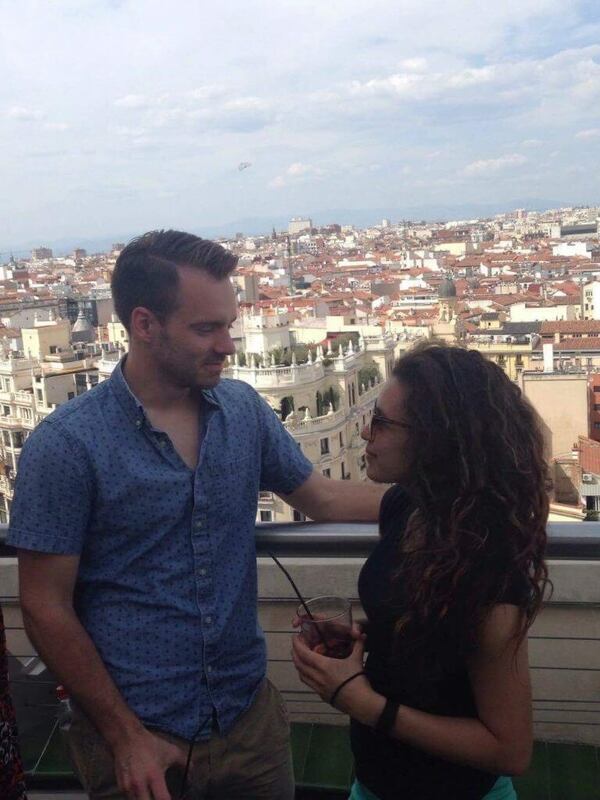 Once again, if you only go to one rooftop bar in Madrid, go to the Círculo de las Bellas Artes. The Hat – The Hat is a unique rooftop bar, in that it doesn’t have a spectacular view. However, it does have amazing drinks, and it’s located in an eco-friendly hostel. 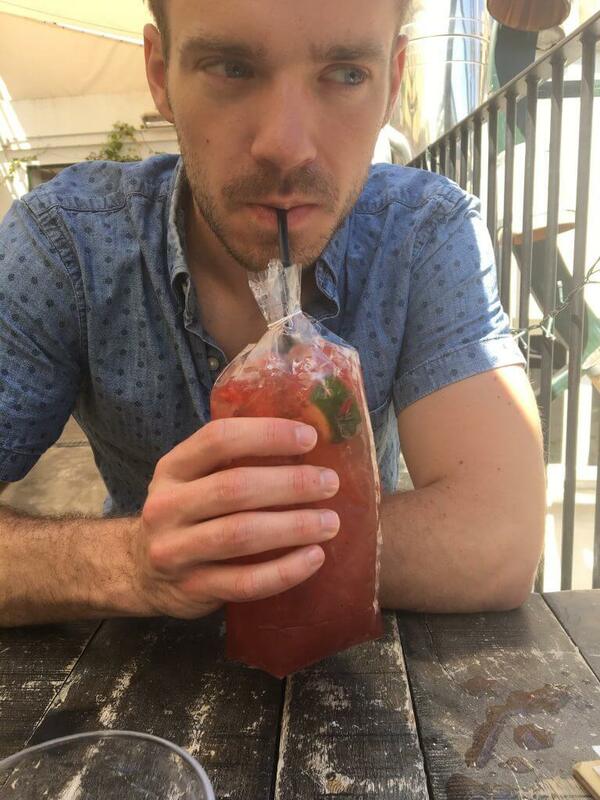 We ordered some of their special cocktails that were served in reusable plastic bags, and they were really good. La Terraza de Óscar – La Terraza de Óscar is an awesome rooftop bar in Madrid that has a really cool atmosphere. The views aren’t as good as the Círculo de Las Bellas Artes, but they’re better than those at the The Hat. While we didn’t see it because of when we visited, there’s even a rooftop pool at La Terraza de Óscar! La Venencia – We know what you’re thinking…FINALLY! A non-rooftop bar! Either way, La Venencia is one bar that will bring you back to the 1930’s in Madrid. It keeps it’s old classic feel without any present day flashiness. 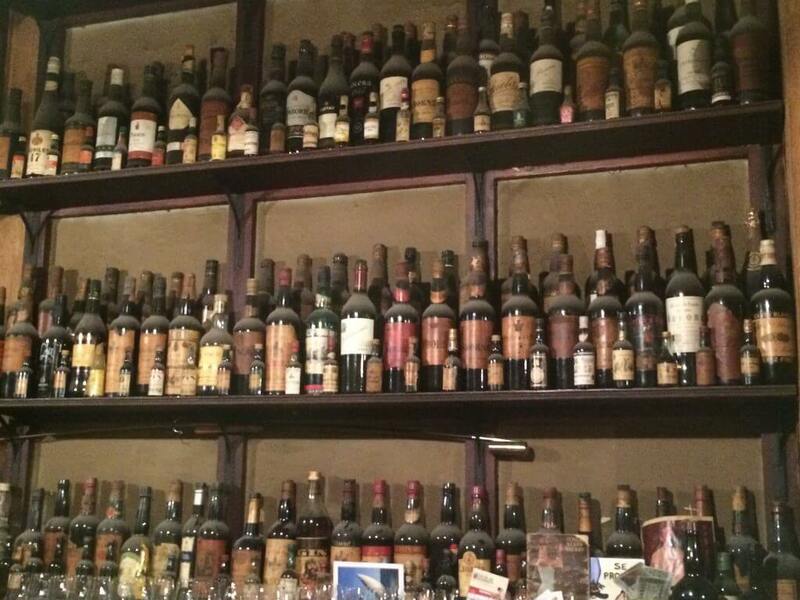 La Venencia is known for its sherry, and, in fact, Ernest Hemingway used to drink here. 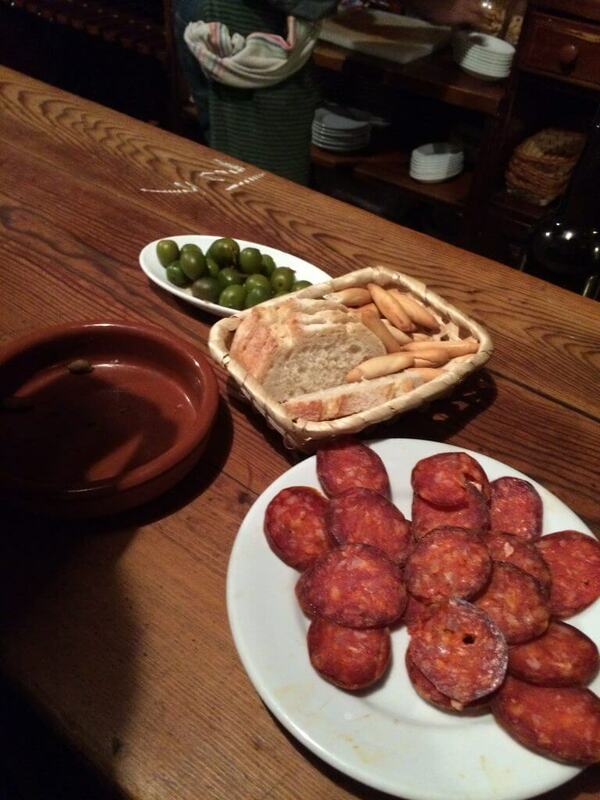 While you’re sipping on sherry, make sure to order some tapas too. They’re simple, yet delicious! Have you ever visited Madrid? What recommendations do you have for people visiting Madrid? What are the best things to do in Madrid? Where are the best places to eat and drink in Madrid?